You didn’t hear about it? Well now it’s time to find out how to use Instagram Nametag. What’s the first thing you do after you meet someone new who you want to get to know? Look them up on social media, of course! But finding a friend’s online handle can be tricky, especially when usernames, which often must be unique to the user, become increasing difficult to spell out (let alone pronounce) as more people sign up. That’s why a few networks—including Facebook, Twitter, and Snapchat—already have features that allow users to generate QR codes that friends quickly scan from their phones to locate the associated account. Where do you find Nametag? To access your Nametag, simply click on your profile, and go to the menu on the right. Selecting Nametag will bring up your personalized code. From this screen you can personalize your Nametag with emojis, a selfie, or the classic IG color scheme. You can also scan a friend’s code by tapping “scan a nametag” at the bottom of the screen. So, next time you’re trying to figure out how to spell “Rrrrachael_Rulz77,” just ask her to show you her Nametag instead. Reach out, and say “Hi!” on Instagram | Facebook | Twitter or check out mikespeer.com for more content. Interested in getting stories like this delivered right to you? Sign up for the mailing list and get curated content about business, marketing, and entrepreneurship sent to your inbox. Hey Buddy!, I found this information for you: "Tag, You’re It! 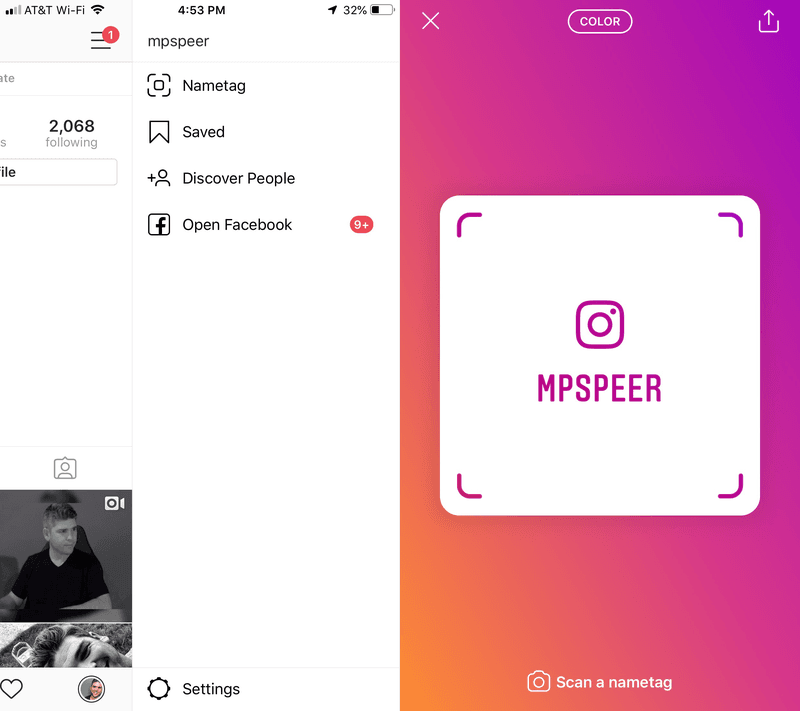 Explaining Instagram’s New Nametag Feature". Here is the website link: https://mikespeer.com/tag-youre-it-explaining-instagrams-new-nametag-feature/. Thank you.